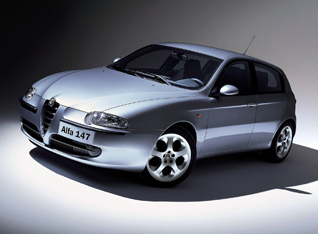 The Alfa 147 won the European Car of the Year award in 2001 because it provided an enjoyable driving experience, but was practical for everyday use. Over the years it was offered in a variety of 4 cylinder engines as well as the mighty 3.2 Busso V6 in the GTA. Overall, the 147 range has proved to be comparitively reliable, but there are a number of ‘watch outs’ when buying any car over 3 or 4 years of age. So what are the top 6 things to look out for if you are going to buy a 147? The Selespeed gearbox fitted to 4 cylinder cars has to be scrupulously maintained, failure to do so can result in costly repairs. Look for evidence of thorough maintenence in service records. The cam belt on all 4 and 6 cylinder engines must be replaced at prescribed intervals. Failure to do so can result in serious damage to the engine. Factor the cost of this into the price of car you are considering. Knocks and clunks from the suspension can mean worn out upper front wishbone bushes, sway bar mounts or radius arm bushes. Warning lights for the engine, air bag or braking system might be something quite minor like a sensor, or they might mean something more serious. This is one for a specialist, the best way to diagnose these problems is to connect the car to an Alfa/Fiat Examiner tool. Replacement keys can be very expensive, look for a car that comes with 2 factory keys. If you are looking for a GTA, look for a car that has a limited slip differential – either a Q2 or a Quaiffe. The factory differential is a common failure which can result in gearbox damage. If the car you are looking at doesn’t have an LSD, try to factor that into the price of the car. If you are looking for a 147 and you would like a second opinion, book one of our pre purchase inspections – 9386 9650.